The first aspect you start to wonder is the song titles named in an Oriental alphabet when we’re talking about a Czech band… something that sparkles you curiosity. Then, when you listen to the album, everything is understood. Let me start talking a bit about the band and then I’ll share my views on the album afterwards. Cult of Fire is a relatively young band, founded in 2010 in Prague, Czech Republic. The band members are quite experienced though, you can sense when listening to the album. 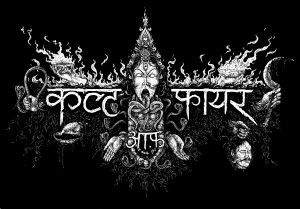 Well, after an EP named 20:11 and a full-length album titled Triumvirát, respectively released in 2011 and 2012, Cult of Fire grants us a masterpiece in 2013 named मृत्युकातापसीअनुध्यान (Ascetic Meditation of Death). As for the music itself on the album, it’s indeed a journey, the atmosphere is, obviously, very oriental and magical, taking you into the obscure realms of Kali Ma throughout an indeed meditation of death. The musical is fast-paced, but yet still ritualistic, well composed, complex and artistic. In many ways sinister, the album is filled with Hindi chants as well as oriental sounds, मृत्युकातापसीअनुध्यान, although the thematic, is a beautiful trip to a dark domain. The music will certainly appeal to those that enjoy Deathspell Omega’s music, well, for those that enjoy experimental music, I do believe. This is a very interesting album, I will not say that it’s the most creative or innovative of all time, but it’s a very well done, perfectly played and, as I mentioned before, an absorbing release that truly deserves a wider audience. One of the many aspects that I personally enjoyed on this release is that the music is always changing, as some of the fans have stated, you feel that the music is in constant movement. The production is outstanding, all the instruments and vocals are well-balanced, and you can hear them perfectly well. I think I can safely say that it’s almost very polished. It’s really a job well done that will please both black metal fanatics as well as those that are almost audiophiles. मृत्युकातापसीअनुध्यान contains stunning music that can be labeled as Black Metal, but not just that (well, I’m not saying that pure Black Metal is something negative or inferior, I love pure Black Metal), it features some parts that interweaves with post-metal, it’s again, a very hard album to review and “label”, as you find some different aspect every time you listen to this album. If you’re looking for something different, powerful and still atmospheric (I guess I’m on an atmospheric mood, as I’m reviewing many of such music lately), this is the perfect album for you. For us, westerners, it’s about the occult, about death and the goddess of destruction, a different thematic on Black Metal (yes, some bands have the Hindu religion as an influence, but it’s not a really a widespread theme on Black Metal). I wish I knew more, as I find it very interesting. Well, I’ll be ordering some books right now. And you, please, give Cult of Fire a chance and, if you like their music, support the band. Their music is amazing, in my modest view, of course.